We love a freakin’ casserole ‘round these parts. We think about them, we write about them, we dream about them, we cook them, eat them, and get stuck in our feelings about them. So it’s probably not surprising that we have some thoughts about the latest from the bakeware wizards at Pyrex. 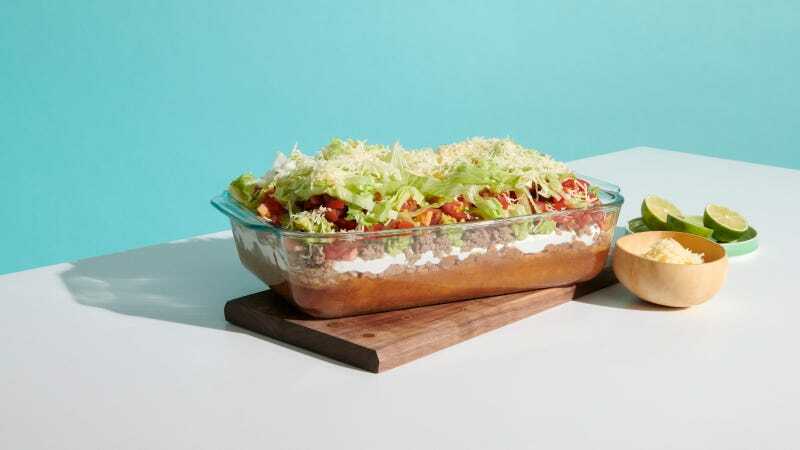 Pyrex Deep is, per a press release, “a collection of the deepest baking dishes in the glassware category,” a set of roomy dishes up to 50-percent larger than standard glass bakeware. That means you can add more layers, more sauce, more filling, more stuff. Of course we debated these suckers in the Takeout offices, but before that happened, I had my very own contentious debate in my head. On one hand, casseroles are all about stuff. How can more be bad? “Oh no, an extra layer in this lasagna, how terrible,” is a thing no one has ever said. I love making my grandma’s green bean casserole, which calls for a lot of experimentation, and sometimes I add too much and the thing sometimes bubbles over. Problem solved, extra water chestnuts for everyone. More stuff! I love stuff! On the other hand, at what point does a casserole—or a crumble, or a cobbler—stop being a casserole and start being a rectangular bowl of soup (or warm fruit)? There’s a decent chance that it’s somewhere in that extra 50 percent. Casseroles need to set at least a little; increase the filling, and you decrease the odds of anything resembling structural integrity. I’m not calling for rigid edges, but you don’t want soup. And then there’s the real key to any casserole, which is also the key for most non-cake dessert bakes. You want the crunchy or crisp bits on top. When there’s too much underneath, you throw off the topping ratio. Who wants the crumble to get lost? Who wants lasagna without a solid helping of crispy cheese and noodles? Overall, I landed on the pro side of things, not least because the press release came with that gorgeous picture up there of a cornbake that Milk Bar’s Christina Tosi made in one of these suckers, and I immediately wanted to eat it. And I’ll for sure get one before Thanksgiving rolls around. But the heart wants what it wants, and my heart wants some crispy bits. Maybe an all-edges lasagna dish can be next on Pyrex’s innovation to-do list? Pyrex Deep comes in three sizes, the most expensive version costing $18.